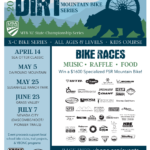 Back for 2019 is the California DIRT MTB Series, one of YBONC Foundation’s fundraisers to support programs for Nevada County school bike clubs. 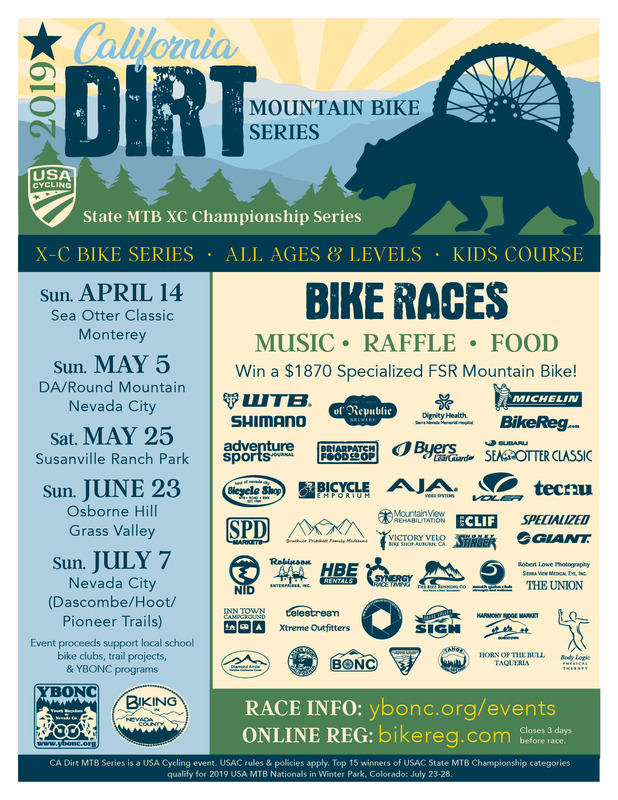 We have been selected again by USA Cycling to host the 2019 California MTB XC State Championship as a series. There will be a cash purse to the Pro classes. Cash prizes will vary depending on class size/participation. Podium medals and a fee bundle package if you know you will race all race dates. Our success is due to our amazing volunteers. From YBONC members to enthusiasts to racers who want to give back, we thank you! If you can help us in the 2019 series, please contact us. You can download and sign the USAC volunteer waivers below for each race you plan to help. 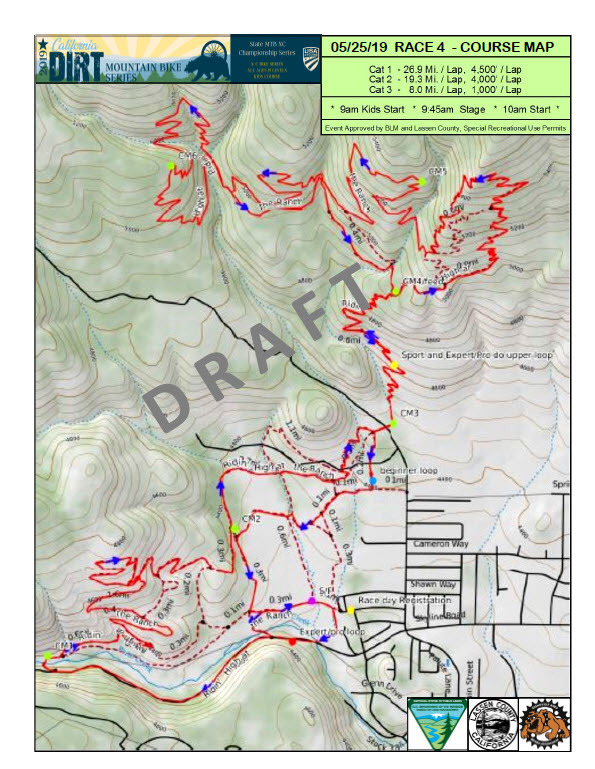 Course Map available 1 week prior! Courtesy of a private land owner, please be respectful with no pre-riding. If you are not a USA Cycling license holder, we are required to charge a $10 fee for a day license. This is a required rule by USA Cycling as of 2014. Want to purchase an event jersey? Click here! ahead and e-mail yboncfdn@gmail.com. If you email first and the answer is here, we may not reply. 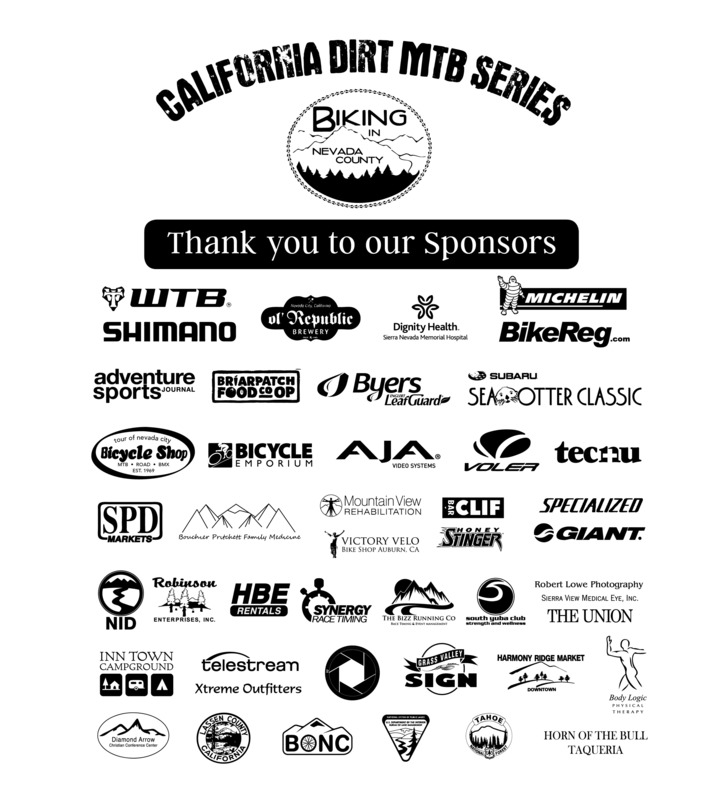 What is CA Dirt MTB Series? The Series is a YBONC Foundation fundraiser to support Nevada County school bike clubs, approximately 220 youth county wide. 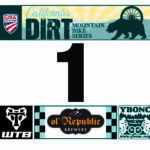 ALL racers who finish in the top-15 in their category and class at any of the CA Dirt MTB Series event qualify for USA Cycling’s MTB National Championships. Only riders from California who hold a USA Cycling annual license are eligible for the State Championship. Can I race if I’m not from California? Yes, just as a registered racer in CA Dirt MTB Series, we still are awarding top 3 podium spots with our locally made CA Dirt MTB Series medals. What is a USA Cycling CA State Championship Series? A USA Cycling MTB State Championship Series includes two or more events in which riders accumulate points in discipline/class/category/age toward an overall total for the series. The highest ranking rider of each discipline/class/category determines the USA Cycling State Championship winner. How do I qualify for Nationals? The top 15 riders in each category overall at end of series qualify for MTB Nationals and must hold an annual racing license to register for nationals. If it is an “open” category (ex: Junior 10-14, Men 60+), they qualify to race at nationals in whatever category is listed on their license as of December 31 of the current year. Will I qualify for nationals with a one-day license? 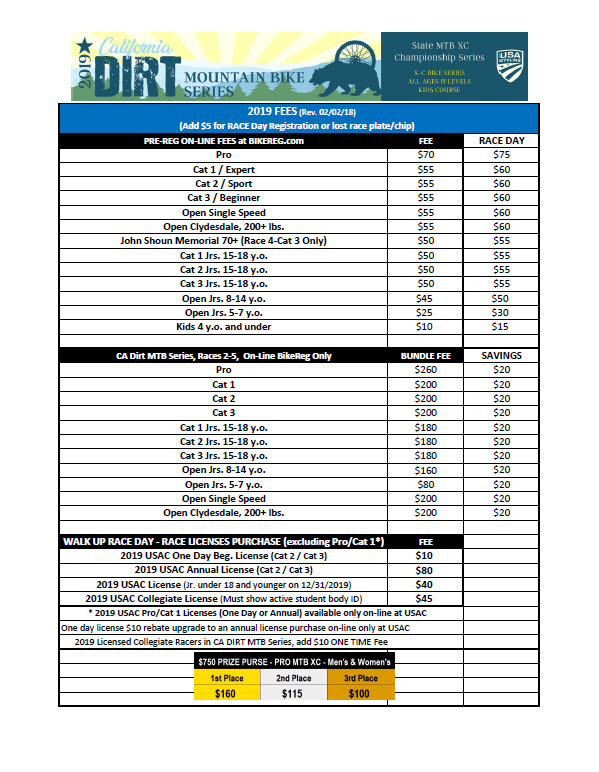 You will qualify for Cat 2 or Cat 3, but you must purchase an annual racing license before starting Race 5 of series. Do I need to buy a USA Cycling license to race Cat 1? Yes. 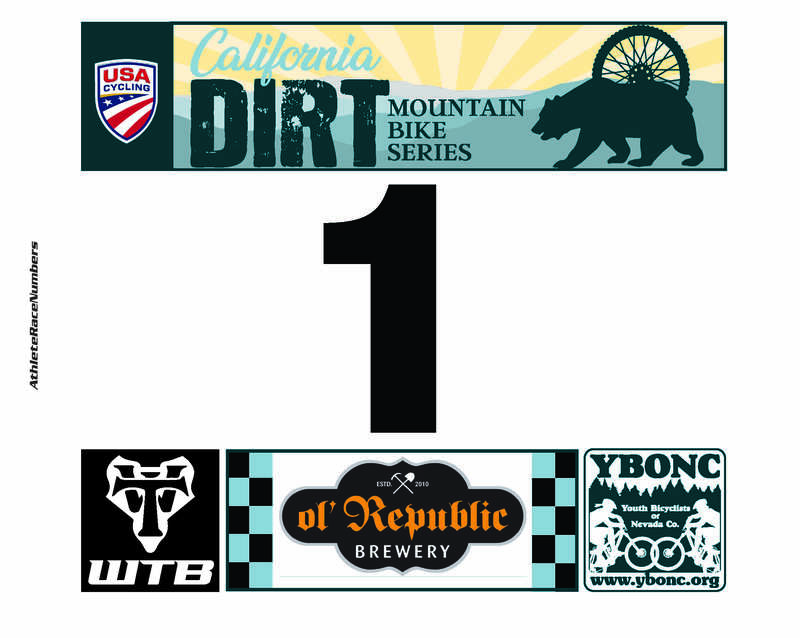 To race at an individual race in the CA Dirt MTB Series, you may race Cat 1 on a one-day license ($25) purchased on-line at USAC. Registration says it’s open until 12Midnight Pacific Daylight Time, prior Wed (or prior Thurs) of race day, and it says it’s closed? What gives? Technically, it is open until the posted time and day however, the registration service we use may be doing maintenance or have server issues. We understand last minute decisions very well but we cannot promise the internet is always functional at the moment you wish to use it! Why don’t you have a category for Cat 1 60+, etc.? WE DO for 2019!!! Our categories are based on past attendance. 2018 we have added more to correspond with Nationals. Although they do occasionally change based on need, they are carefully analyzed to provide a fair distribution of distance and ability while keeping costs and time involvement reasonable for the promoter. Very few people want to race in a category by themselves. We do retain the right to combine categories with less than 5 to match national practices, but rarely do so. USA Cycling official on site will make the decision. When are results/series points/USAC rankings going to be posted? In almost all cases, results will be posted to the USA Cycling’s race result website by midnight the day of the event. USACycling official will be present to verify race day results before podium. Every effort will be made to keep series point updated and results sent to USAC in a timely manner. I bought USAC One Day license for Race 1, 2, etc. and decided to purchase a USAC annual license. Will I be refunded for the USAC One Day licenses? No refund. Your one day license purchase will be applied toward an annual license purchase. I couldn’t make a race I signed up for, can I get a refund or credit or transfer to another race? Please send email with valid excuse to yboncfdn@gmail.com, for information on transfers or refunds. It is a case by case basis. The series is a fundraiser event to help YBONC Foundation programs that support our rural schools with bike clubs. We annually engage youth to over 20 miles of trail stewardship projects on managed public and/or private trails (Forest Service, BLM, Water District agency, State Parks and local land trusts). Proceeds from our events allow us to collaborate and organize approximately 300 teens on mountain bikes on trails in Nevada County. I missed the awards ceremony, can you mail me my medal, etc.? If you know you are going to miss podium on any RACE Day, complete an envelope at check-in with your name, address, race no., plate no., registered category, and $3 for shipping. Medals will be not be mailed if you do not complete an envelope. Medal(s) will be mailed after Race 5 – 07/07/19. Can we do more/less laps for the (insert category here)? In many cases, yes. If the entire group wants a change from what was advertised, this can be requested and changed during the riders meeting. The promoter reserves the right to make a change or deny a request based on course and weather conditions and/or rider safety. Decision to be made after discussion with USA Cycling official on site. Decision announced at the racer pre-race meeting line up by category 10-15 minutes prior start times. 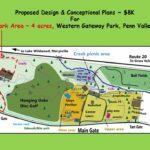 What are the requirements to upgrade categories for CA Dirt MTB Series? 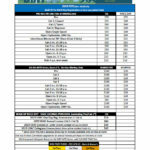 Per USA Cycling, riders can “self select” to upgrade category with approval by USAC official or event director on site. Lower category points are not included in the category upgrade. Proof of current license required at race. To upgrade to Cat 1, riders should have at a minimum 2 top 5 finishes in events with the minimum category size. 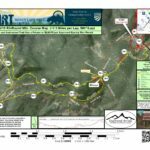 Is there a course map for races? Yes there is if race is on public trails. 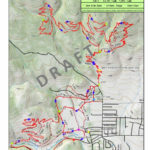 If course map is not posted, there usually is an agreement with land managers to reduce rider use conflicts. 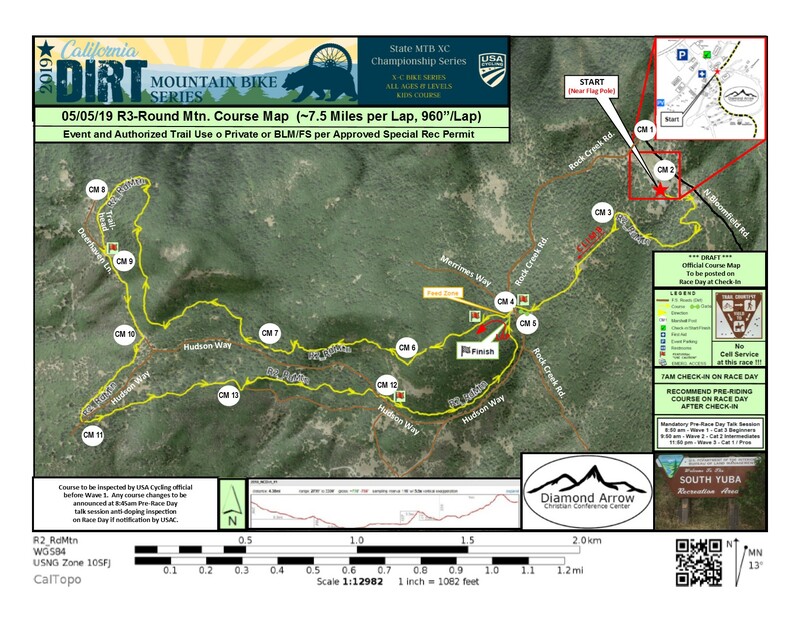 In those cases, maps/routes will be posted a few days to a week before the event, and on Race Day near check-in booth. Please respect our land manager of private lands by only practicing only on designated date/time. If you have a child racing Jr. 6 – 14 y.o. racing 1 lap …..
We attempt to run a safe race for all participants. From past races we are seeing more confident junior racers on the race course. The goal of a first time junior racing should be to complete his or her race, not necessarily make podium. A junior racer must be able to complete race course 1 hour or less for safety of other competing racers racing more than one lap. Our sweep has authority to inform any junior racer the 1 hour limit, and racer is designated “DNF-Did Not Finish” on race results. Winning however, standing on podium would be the icing on the cake! If this is your child’s first race and he/she is not confident racing yet, we request you bike along with your child for support so our sweep may continue supporting the Jr. under 14 y.o. racing field on the course. We are not responsible for your child if he/she bonks and decides to stop during the race. We are requesting parents not to race and to support his or her child who is racing. We cannot reach you if you are racing on the course, if your child needs you for support or a shuttle. Each race venue will be parking volunteers to direct you where to park. Parking is limited in a lot of our venues as they are old logging landings used as trailheads. Parking fee goes directly toward volunteer lunches, port-a-potty rentals, permit fees, etc. as we are 100% volunteer non profit. Please have cash ready as you arrive. Carpool if possible. No one wishes to be preached to so please view this as one mountain bike community member to another. To continue the advancement of our sport, both in creating more trails to ride and more races on those trails, we all need to make an effort to care for those environments. The vultures are always waiting for us to slip up and take away our dirt. Please don’t give them a reason!!! 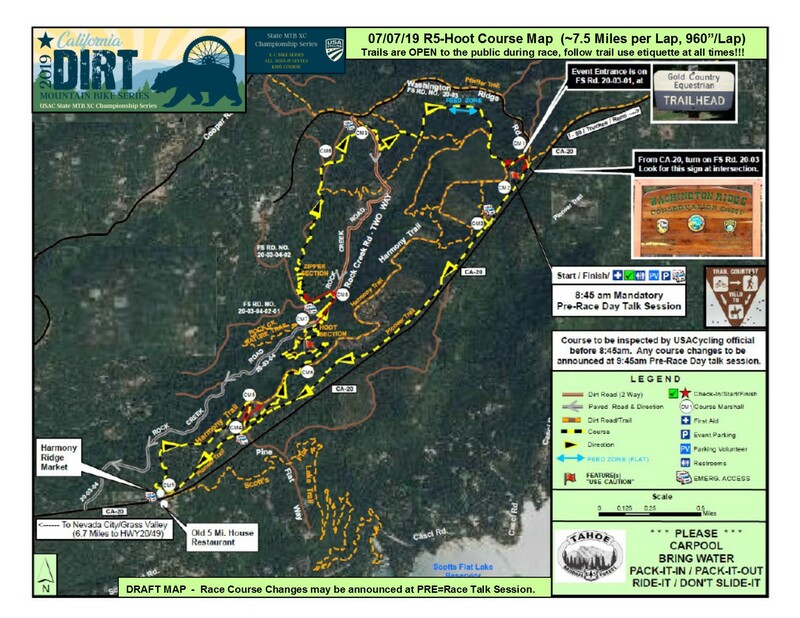 The CA Dirt MTB Series was born from the Nevada City Dirt Classic. The event originally began with the owners of Extreme Outfitters Bicycles, Charlie and Kim Cuisinot in the early 2000’s and YBONC resurrected it. This is a fundraiser series, benefiting Youth Bicyclists of Nevada County Foundation Programs for school bike club youths. 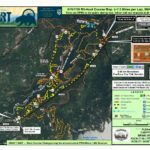 Thank you to the Tahoe N.F. for permitting us this recreational event and at the same time helping us to support our mission.